Do you want a place wherein you can bring back the captured moments during the World War II? Do you want to see how heroic the men are just to defend our homeland? If you want to witness these things, there's a place for you to check out! An undoubtedly world-class museum which gives a tour that has the power to put the involved viewer in a journey to a heroic era, an eventful time of sacrifice and death can be seen in the Home of the Global City, Taguig! Philippine Veterans Museum easily discernible in the expansive and high-ceilinged lobby. This lobby serves as a function room for gatherings for veterans. The main area for exhibitions is circular with a two-level display space. In the area, you can see the tableaux, paintings, display boxes, busts on a pedestal, militaria, flags and photographs in a chronological order. The tableaux shows the different happenings during the World War II. It depicts different emotions which gives life to the life-sized tableaux. At times, viewers are given headsets that narrates the story of each tableaux presented. There's a second floor exhibition which is the continuation of the ground floor. On the other side of the museum has the library, archives, audio-visual rooms, and the theater. Also part of the museums are photographs, memorabilia, and even artifacts which displays the heroic spirit of our great men. If you want to experience going back into time to witness the happenings in the time of the World War II, visit Philippine Veterans Museum at Veterans Center, Western Bicutan, Taguig City, Metro Manila. The museum is open Mondays to Fridays from 7 a.m. till 4 p.m., except during lunch time. Entrance fees are P75 for adults and P50 for students. For more details, call 838-91-48. Unleash the great stories of our dear World War II soldiers! 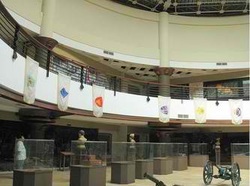 The Philippine Veterans Museum was televised in 24 Oras showing the different tableaux, artifacts, memorabilia, and other things which was gotten from the veterans during the World War II. Watch to see and learn more about the museum.